Available from Saturday 17 February, 2001 at 10:00am. This is Puccini's masterpiece that depicts Butterfly's wholehearted love for Pinkerton with beautiful melodies. A cast of captivating singers will invite the audience to the world of short-lived love. Among the operas by Giacomo Puccini, Madama Butterfly still continues to be loved as a work that is full of exoticism (first performed at la Scala, Milan, in 1904). This will be the third performance after its premiere at the New National Theatre Tokyo (NNTT) in 1998, which produced a great impression on the audience. It is said that when he was composing this opera, Puccini, who had never visited Japan, was given a lecture on Japanese music by Hisako Oyama, wife of the Japanese Minister to Italy. A number of Japanese melodies that were effectively and skillfully used not only produce an exotic atmosphere but also give unique nuances to the work. 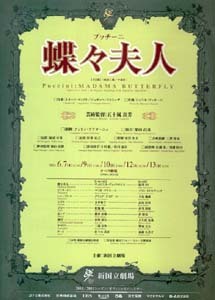 Madama Butterfly is filled with Puccini's own brand of lyricism, including the duet of sweet love between Butterfly and Pinkerton and Butterfly's aria, "Un bel dì vedremo (One fine day)," which are quite impressive. The forthcoming performance to which NNTT dared to invite a soprano from overseas for the title role will bring a new level of excitement. Japan toward the end of the 19th century. U.S. Navy Lieutenant Pinkerton is introduced to 15-year-old Cio-Cio-San (Madama Butterfly) in Nagasaki, where his ship called, and holds a wedding in the city. Although Butterfly is seriously in love with Pinkerton, to him it is only a transient love during his journey. Before long, Pinkerton returns to his U.S. home and Butterfly, who is left alone, continues to wait for her husband in the belief that he will return to her. When American Consul Sharpless asks her, "If he does not return?," he is in turn requested to advise Pinkerton of her boy, who was begot by him. As soon as she finds out that Pinkerton has arrived in Nagasaki on a warship for the first time in three years, she prepares to welcome her husband by decking her entire house with flowers. But Pinkerton visits her house accompanied by an American woman. Guessing the truth, Butterfly asks him to look after her son and then commits suicide.